… It’s Easier and More Secure Than You Think ! The easiest way to adhere to the mobility requirements of nist 800-171 is to simply not allow employees to use their personal devices to access CUI – or really any work relates data, correct? Well not any longer! If you are like most companies, your employees do not want to be forced to carry one device for work and a separate device for personal use. Additionally, the costs to acquire, distribute, maintain and recoup corporate-owned devices could always be better spent elsewhere. …And then do you standardize on iOS or Android? Either way, a significant percentage of your user base is inconvenienced. Allowing BYOD suddenly seems like an appealing approach. Enable a guaranteed wipe of all CUI and other work or sensitive data – without wiping any personal data or apps. The traditional approach of using EMM solutions has proven time and again to simply NOT be enough. It’s focused on the device, not the data, it’s more vulnerable to malware and other threats, and it creates a level of distrust between the employees and the company. The less complicated and more secure approach is to use a containerized Workspace. 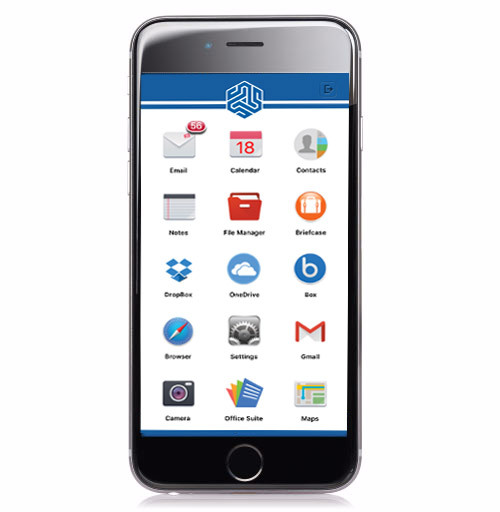 A containerized Workspace creates a seamless and highly secure partition on any iOS or Android device that completely separates business data and applications from personal use information – enabling your employees, and even contractors and other 3rd party workers, to securely access CUI data from any device.